4 What Terminal Tackle Works Best for Lake Fishing? 5 What Type Of Fish Can Be Found In Lakes? There are many lakes in the world. All of them being home to many different species of fish. 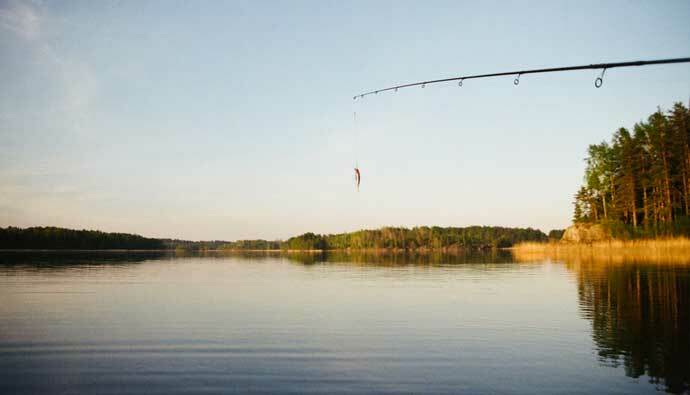 To help you catch more fish we’ve compiled a full guide of lake fishing tips for you! One of the most common being bass. Bass fishing in lakes is probably one of the biggest draws to lake fishing. Lakes provide a peaceful fishing environment. In this article I will be going over some of the lakes in the United States, how to catch fish in these lakes, bass fishing tips, and more! When you’re going fishing but do not have a lot of experience, lake fishing is a good place to start and hone your skills. Bank fishing, also known as shore fishing, is a good place to start before you graduate to offshore fishing or fishing from a boat. 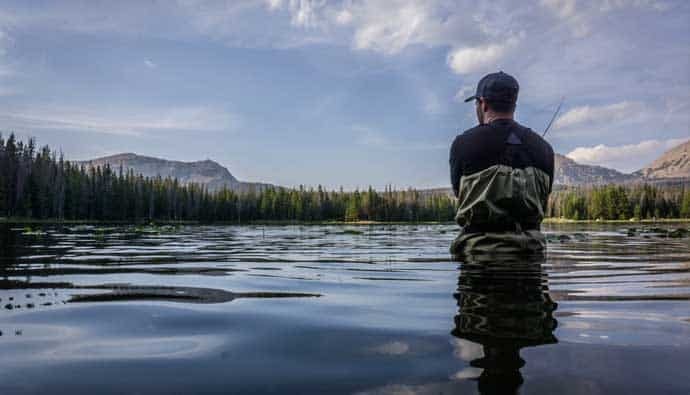 At that point, you need to start by gathering a rod and reel that is easy enough to stow in your vehicle and a backpack to carry your lures and tools in. When picking a rod and reel as a beginner, the reel is more important than the rod. You can go pick up a cheap spinning rod and it will serve you for a good while during your first excursions. As far as a reel goes I personally suggest getting a somewhat decent bass spinning reel that can and will hold up to the larger bass in the lake you are targeting. Next, you need to look at your bait, there are many types and ways to put different baits in the water to catch a multitude of fish. As far as live bait goes if you are fishing for bass with minnows, a good medium sized minnow or shad will suffice perfectly on a bobber rig. Use a baitholder hook through the lips of the baitfish with a split shot sinker 12 inches above the baitfish. Finish off with a bobber approximately three feet from the baitfish. Simply cast that out to a piece of cover (ie: brush pile, weed bed, bridge.) and wait. You will see the bobber moving around in the water and that is okay because you want the fish swimming around in the open water near the pieces of cover. When the bobber starts moving quickly you know a Bass or Crappie is chasing your bait. When your bobber goes underwater set the hook you know you have a fish on the line. But there is also a multitude of methods for catching Largemouth Bass, Smallmouth Bass, Crappie (white or black. ), and Pickrel using artificial baits. There are many options for lure fishings that works well on lakes. For a beginner, some of your hard baits are not worth the amount of money they cost as you are pretty much guaranteed to lose them by snagging them on brush or getting them lodged between rocks. Therefore soft plastics are the way to go. If you happen to get one snagged all you lose is a little bit of terminal tackle and soft plastic, not a $7.00+ lure that you had to convince your significant other that you HAD to have and then losing it the first cast. Trust me sometimes it is not worth it unless you know the water like the back of your hand! When choosing soft plastics as a beginner the best thing to go for are the many multitudes of plastic worms that line the shelves of your local tackle store. I personally suggest picking up a few bags of some cheaper stick baits (Gary Yamamoto Senkos are good but they only usually last one good fish strike. Yum Dingers are the go-to bait for the beginner angler, what you need to do with them is purchase some eagle claw weedless hooks (size 1/0 works best but you can go low with a 1-2 if seems too big) and push the hook directly through the middle of the stick bait. Here’s a great lake fishing tip for getting finicky bass to bite. Have your bait fall slowly with enough action to draw even the most finicky bass to strike even if it is just out of curiosity. When you cast your wacky rigged worm outcast it directly beside the piece of cover, letting it fall with a slack line if you see your line jump or start to move sideways set the hook because you have a fish. If they do not hit the bait on the initial fall you need to twitch your rod tip 3-4 times and let the bait fall again with slack line. Remember to ALWAYS finish your cast, do not just reel the bait back in after the initial fall or after two-three times twitching. I have more than once caught fish directly in front of me because the cast was finished out and the bass was following the bait wondering what it was. Lake fishing is compiled into many different types of fishing depending on what kind of fish you are targeting. We will call this lake fishing 101. You can fish for bass in which case you will be moving fairly regularly and casting into various types of cover, hoping your bait no matter what it is. Sometimes it’s fun to wade out into the water to fish hard to reach areas. This convinces a bass whether it be largemouth, smallmouth, or white bass to eat your bait. is can be from either hunger, a reaction strike, or you just simply make the fish angry from repetitive casts and it strikes out of aggression. You can also do what is called still fishing. Which is directed at much different fish from catfish, gar, white sturgeon, and essentially all types of carnivorous fish. In order to still fish effectively, it takes 3-4 if not more rods with lines out on the bottom or floating. Also with a bobber in different directions waiting on a fish to come up to the bait and eat said bait. There are also many methods of trolling which is not allowed in some lakes. However, where it is allowed, can be a very productive way to catch fish that are schooling. Also, from the reaction of seeing the crankbait move past the location of the predator. This is a very good method to catch striped bass, largemouth bass, smallmouth bass, and crappie (which can school in groups of up to 50 fish so if you find one crappie there are bound to be more in that location.). 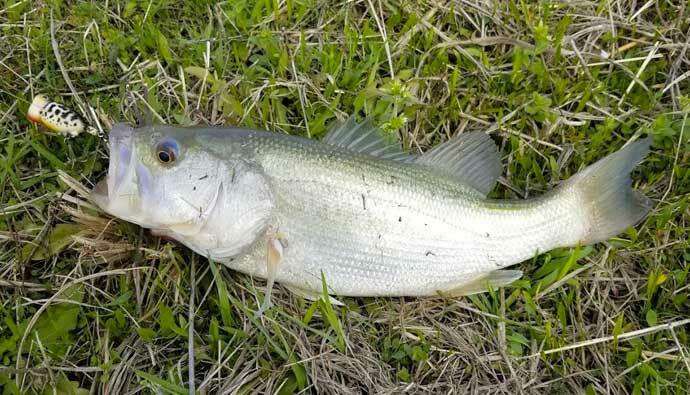 You might be wondering…how to catch bass or how to catch bigger bass? Those are two of the most popular questions on many anglers minds whether they are lake fishing or river fishing. Here Jon caught a largemouth bass with a popper. The pale color comes from the muddy water it was caught in. There are a multitude of ways to fish for bass in lakes and almost always tends to be the biggest draw to lakes when it comes to fishing. There are several different ways to fish for bass. However, there are four that are the must-know basics. These methods also known as bass fishing basics, are called Casting, Flipping, Worm Fishing, and Topwater. When an angler is casting artificial bait, he or she has a swimbait (whether soft plastic or hard bodied) on the end of the line. This method of fishing is one that is fairly easy but can be difficult at the same time until you perfect your technique. You can completely turn the fish off from the bait by simply moving it too fast or slow. It is crucial the bait looks and acts as realistic as possible due to the keen eyesight of bass. As well as different variations in retrieves, you can twitch the bait once and let it die, you can twitch the bait 3-4 times then let it die. Or just twitch the bait with slight pauses all the way back to you in the whole retrieve. The art of casting is essentially a fish styled bait being swum back to the angler 100’s of times, very repetitively past varying pieces of structure. Whether submerged or at the surface. Flipping is a very basic way of fishing that is essentially a creature bait (crawfish, beaver bait, or other small animal type bait). That is either on a jig or Texas-rigged being tossed into very thick cover and the fish hitting the bait on the fall. If the fish does not engulf the bait on the fall a twitch or two could very easily entice a strike. This method is very good for when the fish are holding very tight to cover and refuse to come out when other baits are presented. Worm fishing is a very simple method to fish for bass and can be summed up to the act of throwing a worm type bait at structures or other points of interest to bass. The key to successful worm fishing is very light and subtle movements through the water. Whether you are swimming the worm back to you like a snake or dragging it along the bottom for the deeper dwelling fish. Topwater fishing for bass is a whole completely different beast in and of itself. When you are fishing topwater you want to have extremely long casts along the bank of the lake or beside the targeted cover. When you are topwater fishing there are legitimately thousands of different types of topwater baits. However, today we will be going over frogs as they are the easiest type to use as they do not get hung up in cover due to unexposed hooks. When frog fishing you want to have a very long cast over lily pads, grass beds, or weed flats. You can simply wake the frog back slowly to you or do a series of small twitches back to back with a short two or three-second pause between twitching again. When a bass hits topwater it is proven to get your heart racing and the adrenaline pumping. But do not try to set the hook immediately no matter what type of topwater bait you are using. Make sure to wait two-three seconds before making a rather large and hard hookset. This will ensure the fish cannot spit the hook when it comes jumping out of the water during the fight. What Terminal Tackle Works Best for Lake Fishing? The best fishing setup can mean the difference between a productive day of fishing and going home wondering what happened. The correct terminal tackle also can be the difference between catching the fish or slipping the hook out of the fish’s mouth. The correct hooks to use depends on what you are fishing for as well as what method you are using to fish. The correct hook sizes and types for bass fishing are hooks ranging from size 0 all the way up to size 5/0. Anything bigger can be too big to work for the slightly smaller bass and anything smaller can simply bend or break when setting the hook on a larger bass. The correct hook size for catfish, Pickrel, gar, pike, musky, white sturgeon, etc. are hooked ranging from size 2 all the way up to size 2/0. Anything smaller and your hook will be hidden in your bait and you will not be able to effectively stick the fish in the mouth, and be able to pull the fish in. Any bigger and the fish will spit the hook when it feels it through the bait. The correct weights depend on which type of fishing you plan on doing. When still fishing for catfish or other bottom-dwelling fish the usual size to get the bait to the bottom and keeping the bait in place is generally around one ounce to two ounces. This will ensure you get a good long cast coupled with a good heavyweight to make sure your bait drops as fast as possible. The right sized weights for bass fishing are usually between ⅛ ounce up to ½ ounce bullet or egg weights. These weights slide up and down the line to keep your bait from being completely stuck on the bottom. As well as keeps a good weight to the head of the lure to draw the fish’s attention. What Type Of Fish Can Be Found In Lakes? There are hundreds of thousands of different types of fish that live in lakes (counting the different baitfish and darters.) but today we are going over the fish that live in the United States in this article. These fish can be caught a multitude of ways from soft plastic lures, hard bodied lures, and live bait. These are the most popular fish anglers go after in lakes in which they are known to reside in. as well as the many different species of shad (as well as minnows and darters). These fish can either be caught with a line, a casting net or can be easily purchased at a local bait store. 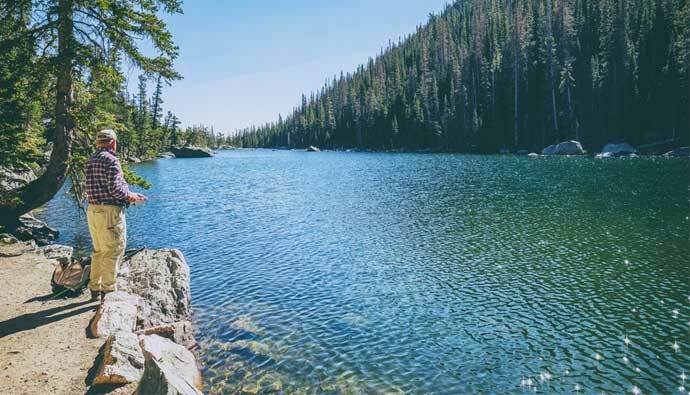 Whether you are a beginner or an angler that has been fishing for years, your local lakes can be a very good choice for your next fishing trip! They are home to some of the biggest fish that do not live in the ocean. Bass tournaments held on many public lakes have yielded some of the largest bass ever weighed. So, next time you are planning on going to your local lake always remember to bring the children in your family fishing! The art of fishing, especially bass fishing, will soon die out if we as fisherman do not teach the younger generation the act of fishing. Where do you like to lake fish? Let me know in the comments below! Q: What is the best lure for bass? A: This is a question asked by just about every angle. It is our opinion at Cast and Spear, that soft plastics offer the best results. This is especially true in the case of soft plastic worms. Q: What do bass eat? A: Bass are a predatory fish, and an opportunistic feeder. Bass will try to eat anything they can fit into their mouth. This can be frogs, smaller fish, bugs, and even snakes! Q: What is the best time of day to catch bass? A: We have found the best time of day for bass fishing is in the early morning and late afternoon hours. These seem to be peak feeding times.